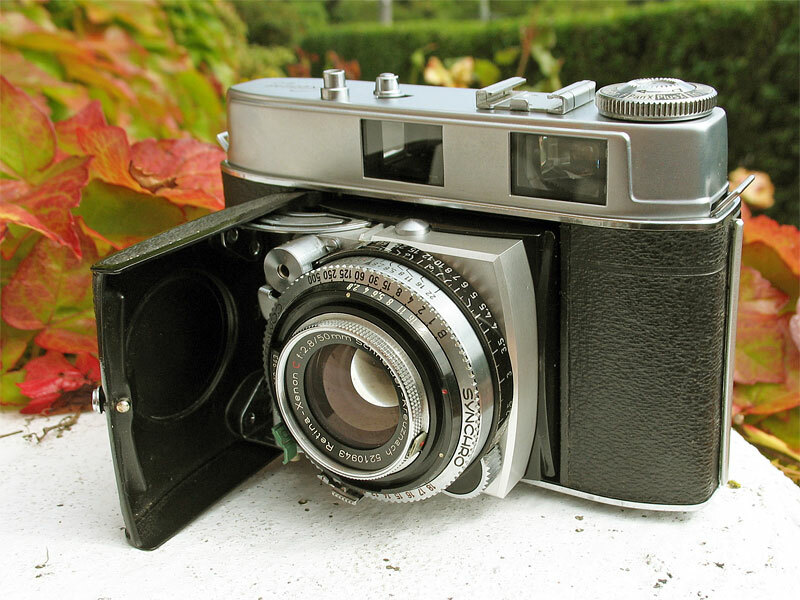 This folding 35mm rangefinder camera replaced the earlier Retina IIc (type 020) in 1957 and was only in production until the following year, with probably fewer than 20,000 being made. This model was apparently never marketed in the USA. The Retina IIC differed from the earlier model by incorporating a new bright-line finder in a taller top housing identical to that used in the Retina IIIC (type 028). The finder is complete with frame lines to suit the 35mm and 80mm accessory lenses, so an accessory finder is not required when using these lenses. Just like the earlier IIc, the new Retina IIC was available with either a Rodenstock Heligon, or a Schneider Xenon interchangeable 50mm f/2.8 lens. The lens system is the same as that used for the Retina IIIc, and this camera can use the wide range of accessories made by Kodak for the Retina cameras. Accessories included the wide-angle and telephoto lenses, and accessory finders to suit, a close-up rangefinder and lenses kit, a prism-type splitter for taking stereoscopic pictures, a microscope adapter, copying stand, hoods, filters and a curious ground-glass adapter. This example has a Schneider Xenon lens, and the focus scales are marked in feet rather than metres, so was probably originally sold in one of the Commonwealth countries, perhaps even here in New Zealand, where I purchased it recently. The Retina IIC is one of the most sought-after Retinas, a very popular model with both collectors and users.